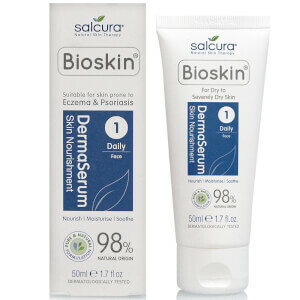 Gently cleanse dry, itchy and sensitive skin with the Bioskin Face Wash from Salcura, experts in skin therapy products for eczema, psoriasis, dermatitis sufferers. Ultra-moisturising and packed with vitamins and minerals, the nutrient-rich formulation works to wash away daily impurities, sealing in the benefits of natural essential oils (Jojoba, Argan, Borage, Rosemary and pink Grapefruit) and botanicals (Witch Hazel, Green Tea and Sea Buckthorn), whilst respecting the skin. Enriched with natural foaming agents to prevent drying skin out, the mild facial cleanser leaves you with a soft, smooth and nourished complexion. When suffering from dry skin, try and keep the water on a luke-warm temperature as hot water can dehydrate the skin even further. Apply the Face Wash to damp skin and massage it in. Leave on the skin for a short while. Rinse off and dab dry. Aqua, Lauryl Glucoside, Glycerin, Cocamidopropl Betaine, Xanthan Gum,Starflower Essential Leaf Extract (Borago Officinalis Leaf Extract), Green Tea Leaf Extract (Camellia Sinesis Leaf Extract), Purple Coneflower Extract (Echinacea Purpurea Extract), Witch Hazel Leaf Extract (Hamamelis Virginiana Leaf Extract), Phenoxyethanol, Sunflower Seed Oil (Helianthus Annus Seed Oil), Limonene, Grapefruit Peel Oil (Citrus Grandis Peel Oil), Sea Buckthorn Kernel Extract (Hippophae Rhamnoids Kernel Extract), Ethylhexylglycerin, Lemon Peel Oil (Citrus Limon Peel Oil), Caprylyl Glycol, Argan Kernel Oil (Argania Spinosa Kernel Oil), Safflower Oil (Carthamus Tinctorius Seed Oil), Jojoba Seed Oil (Simmondsia Chinensis Seed Oil), Citral, Beta-Carotene.